Rich got an awesome surprise Christmas present this year! 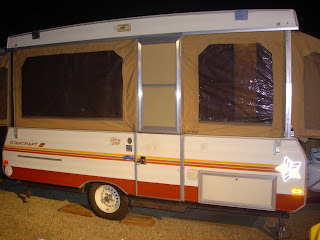 I surprised him with a new camping trailer, and boy was he surprised! 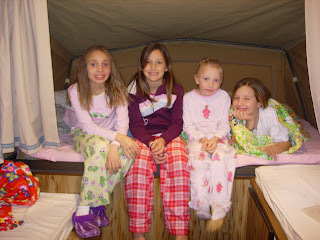 After setting it up,and seeing how awesome it is, the girls talked me and Tori (next door), into having an "easy bake oven slumber party" last weekend in the new camper! We had a blast! 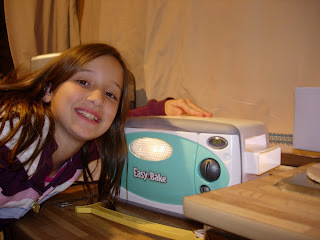 But.....we found out that the easy bake oven isn't so easy, or you have to be smarter that the instructions! 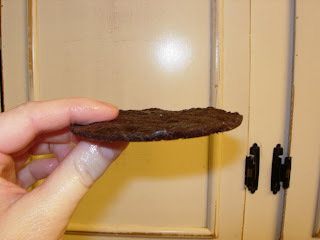 This was our 1st attempt to a chocolate cookie. Hey, if nothing else we got a great laugh. The 2nd attempt was lots better, but we dropped it on the floor, still funny, and they ate it anyway, 10 second rule, right?